Do you consider yourself a football genius? Do any of your friends argue they know far more than you? 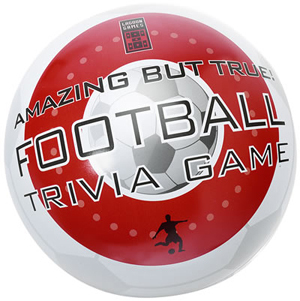 Well find out for sure if your football knowledge puts you in a league of your own with the Amazing But True Football Trivia Game. With all the parties and pub crawls ahead of you a handy pocket sized football game is perfect for football enthusiasts everywhere. It comes with 300 questions on 50 cards, playing pieces and a handy fold away board all designed to conveniently sort the football fool’s from the Football boffin’s. You can even get into teams and group your knowledge to win the title of Trivia Champions..